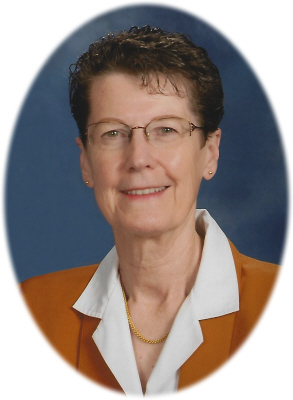 Lana Jean (Brandal) Sanders age 72, of Owosso, went to be with the Lord on Tuesday, February 5, 2019 at the Oliver Woods Retirement Village, Owosso, MI. Visitation will be held at Smith Family Funeral Homes, Ithaca, MI. on Wednesday, February 13, 2019 from 4-7 P.M. A Memorial Service will be held later at Smith Family Funeral Homes Ithaca, MI, on Saturday, February 23, 2019 at 1:00 P.M. with Jo Jones officiating. Burial will take place at a later date at North Star Cemetery, North Star, MI. Lana was born in Alma, MI on June 20, 1946, the daughter of Harry and Edna (Shaw) Brandal. The family resided in Ithaca, MI. After her father passed away, the family moved to Ashley, MI. She graduated from Ashley High School with the class of 1964. Lana worked at the Ashley Bank for a short time, then moved to Lansing and worked at the Dept. of Agriculture and for the U.S. Postal Service. Lana married Billy J. Sanders on September 8, 1979 at the Ashley Methodist Church, Ashley, MI and they moved to Marshall, MO. There she worked for the city of Marshall and later for Dr. Kelly, DDS. Lana was a member of the Marshall First Baptist Church, where she was a greeter for services and loved being with her church family. Lana loved people and strangers quickly became friends. She liked taking long walks, riding her bike, crossword puzzles, all animals and volunteering at the hospital gift shop. She loved her 3 cats, anything red, and had a talent for writing poems. Family members looked forward to getting a birthday card poem and drawing from her each year. Lana leaves behind her sister Paulette (Neil) Somers of Chapin, brother-in-law Rick Beracy of Ashley, and many nieces, nephews, and cousins. She is predeceased by her parents, her husband Billy J. Sanders, brother Richard Brandal, sister Wanda Beracy, and step-father Dan Johnson. In lieu of flowers, memorials may be made to the Senior Activity Building in Ithaca, 1011 E. North St., Ithaca, MI 48847. Online condolences can be made at www.smithfamilyfuneralhomes.com. The family is being served by Smith Family Funeral Homes, Ithaca, MI.